I was going to post another item this weekend but I felt this partly finished article ought to go out now. The reason is because of the William Hill award for the best Nessie sighting of 2011 and there are four contenders including the sighting in this title. The winner will be decided at the end of January and I thought it best to complete the story on this sighting so that whoever judges will have a fuller picture. Note, I have no interest in who the eventual winner is and I do not stand to gain financially from it! The award candidates do not even know I am writing this. In fact I have been looking into this case since July and was awaiting further information, but so be it. Back in July I was at Loch Ness and stopped at the shop of the Hargreaves at Foyers to buy some provisions (I documented that in an older posting). So I talked about their sighting with them and before I left the lady said that an Ala MacGruer had seen something too. I noted the name and headed south back to Edinburgh. When I eventually found and got round to talking to Mr. MacGruer, he did indeed confirm that he too had seen a strange creature around the same time that day but closer to the shore. He was driving along a local road further downhill when his attention was taken by an elongated object in the water. He stopped the car to have a look and described an "eel-like head" with a neck about two feet out of the water. He described it as going at quite a fast speed towards Sand Point. In other words, the creature was heading in the general direction of the loch where the Hargreaves saw their head and neck. Eventually it disappeared past Sand Point. Mr. MacGruer estimates it was up to 300 yards away from him and so substantially closer than it was to the Hargreaves. I hope that is as accurate as I can state it as it was conducted over the phone and then by letter and with my lack of knowledge of local small roads in Foyers. Ala sent a drawing of what he saw. Ala MacGruer is a pensioner and has spent his life living by Loch Ness. He is an experienced angler and has spent many, many hours fishing on Loch Ness and beyond. His knowledge of the loch and what can fool a person is therefore above the average witness standard. I asked if he had seen anything like this in his life before but he said he had not. He recalled how one could be fooled by birds observed in mist and hence giving a wrong impression of size, but that day such conditions did not prevail. Those who may suggest that he merely saw a seal ought to give him some leeway given his lochside experience. Clearly, Mr. MacGruer's account adds weight to what the Hargreaves saw and diminishes the chances that something was misidentified - especially with a good witness at a shorter range. Reports of the Loch Ness Monster seen by multiple witnesses are good. It is even better when they view the creature independently and unaware of each other's situation. As an aside, readers familiar with the history of the Loch Ness mystery may recognise the surname MacGruer. Indeed, without me prompting him, Ala declared that his uncle William MacGruer had seen the creature on land as a young lad. I told him that this was no surprise to me as that case from almost 100 years ago is part of the Loch Ness Monster lore. That particular case was reported in the Inverness Courier on the 3rd October 1933 and describes how a group of children playing on a bay near Fort Augustus were surprised and terrified to see a large creature with a long neck and a camel like head lurching out of the bushes and entering into the loch. It seems that his uncle stuck to that story to his dying day. So I give you Mr. MacGruer's account and hope it adds to the credibility of what happened on that day on the 15th June 2011. I have still a few things to say about this classic photograph of Nessie redeemed from the jaws of the Labrador dog. We pointed out the real possibility of a head being visible to the right which had been hidden for decades by over-contrasted reproductions, but there is more to come as we wrap up this important piece of evidence. These concern the place taken, the time taken and the reaction to the picture by the media. In this post we consider the last point and an interesting newspaper item from page 15 of the Courier Herald dated the 8th December 1933. The photograph had made international headlines and naturally people speculated as to what it may be showing. Curiously, no one mentioned Labrador dogs with sticks in their mouth and we put that down to having a superior reproduction of the photograph to hand. The article is shown below. An animal with the body like a whale, a head like a seal and an elongated tail. Did someone say a head like a seal? Where did they get that from? I would suggest they spotted the head which we highlighted on this blog last year. It's nice to get some corroboration and from a source mere days after the picture was taken. The only difference is that he takes it to be seal-like rather than our eel-like speculation. The truth is that we are not sure what head it represents, but it is there as far as I am concerned. It is no surprise, meanwhile, that the self-appointed experts of that day utterly failed to see any thing other than "wreckage" in the photo. I toned down my berating of those who think this picture is a Labrador Dog. However, a cursory look at various sceptical forums/websites will leave you in no doubt that no one is perfect in the matter of courteous debate (albeit with an allowable modicum of mild sarcasm). The Inverness Courier has some voting buttons on its website for readers to choose from the three best sightings of 2011. These are Jon Rowe, William Jobes and the Hargreaves. We have covered these sightings on our own list plus the Diane Blackmore sighting of August and the Atkinson sonar trace of September. There will undoubtedly be other sightings of Nessie in 2011 which did not make it into the local and national media (in fact, we'll bring one soon on this blog). I guess it has been a good year for Nessie sightings, especially considering the Jobes and Rowe sightings included pretty good photographs. However, the report log is a far cry from the record year of 1934 and people began to wonder whether the Loch Ness Monster had gone off on some holiday somewhere or worse. Anyway, let us hope 2012 is a more successful year for evidence of the strange resident of Loch Ness. The latest news on the BBC about a "virgin birth" shark reminds me again on how a Nessie population is sustained in the relatively small volume of water that is Loch Ness. To recap, in the absence of a male shark, this female shark in a Dubai aquarium, has produced offspring for the fourth year in a row. It seems the descendants are doing well. and are not exact clones having some minor DNA differences There is nothing new in this scenario as various fish, reptiles and amphibians are known to reproduce asexually. However, the process has not been observed naturally in mammals. This form of reproduction can be "turned" on and off depending on various factors such as a lack of males, seasonal factors, conditions that favour rapid population growth and so on. It has its advantages and disadvantages compared to normal reproduction. There is the reduction of the gene pool diversity and concomitant susceptibility to new mutations and diseases but on the plus side, there is no need divert scarce resources to develop males which cannot reproduce offspring themselves. But does this have any relevance to the Loch Ness Monster? 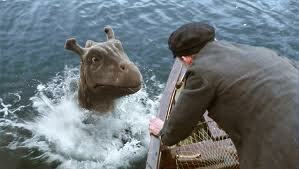 Curiously, the Nessie portrayed in the 2007 film "The Water Horse" (below) was asexual with a population of exactly one creature whose progeny were propagated by a single egg it laid. No problem with food stocks there then! They say that "life always finds a way" but when it comes to one or more large creatures in a 24 mile long loch, scepticism adds "but not in this case". The question frequently levelled at Nessie "believers" is that there is not enough food to sustain a viable population of large creatures. Firstly, I don't accept this and shy away from the two dimensional thinking that goes on in this matter. However, assume that there is a prey-predator ratio issue for the moment. Asexual reproduction would reduce (perhaps significantly) the number of creatures in the Loch. Certainly and statistically, half of them (the males) can go (well, some are needed if the females switch out of asexuality). It would also eliminate inbreeding brought on by generations of the same pool of creatures inter-breeding. However, what the minimum viable population may be for such a group of asexual Nessies is pretty unclear. But there is an opening there for lower creature numbers. But what about lack of genetic diversity? Well, how often do Nessies reproduce? Once a year? Once a decade? The longer the generations, the less the impact of genetic diversity. There is also the matter of how stable Loch Ness is to changes that expose lack of genetic diversity. So what has happened at Loch Ness in the last 10,000 years that may endanger a small gene pool of monsters? But it is all speculation when it comes to this decidedly odd beast. So, was it the case 10,000 years ago as the glaciers retreated in Scotland that one or a few female Nessies became trapped in Loch Ness as the land rose from the burden of immense amounts of ice? Did asexuality kick in to preserve the continuation of the species? Did the creatures switch between asexual and sexual across the millenia depending on various environmental factors? Who can tell? But as I said, such a scenario is not mandatory to explain how the Loch Ness Monster has survived to this day. The creature was moving between the seas, land and other lochs long before man ever became inquiring enough to ask such questions.